Total solar eclipse over South Carolina. South Carolina eclipse. Great American Eclipse. 2017 solar eclipse. Solar eclipse 2017. 2017 eclipse. 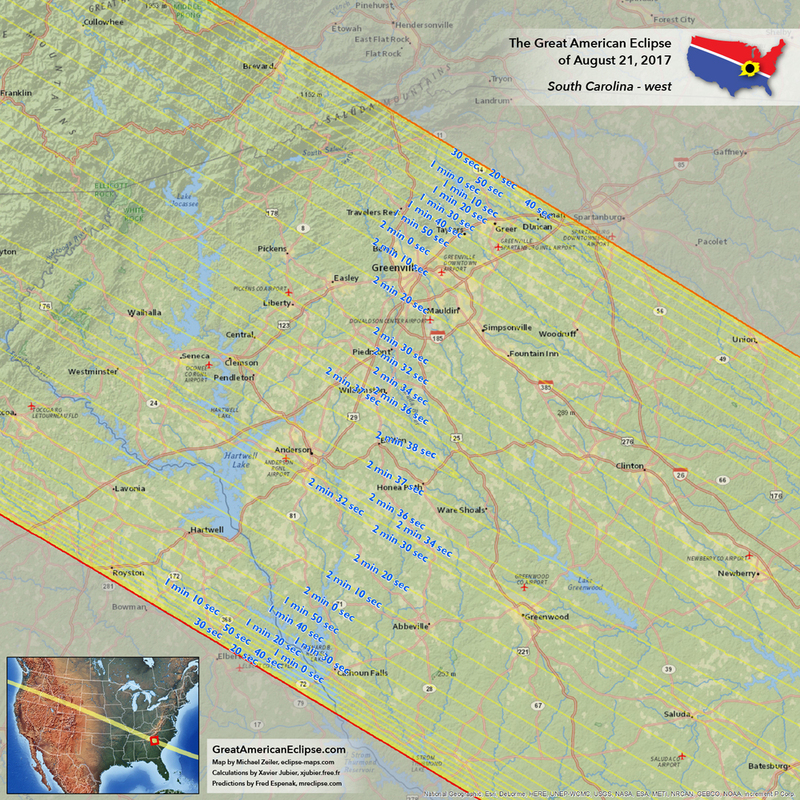 The eclipse leaves the USA at South Carolina, returning to the USA seven years later. 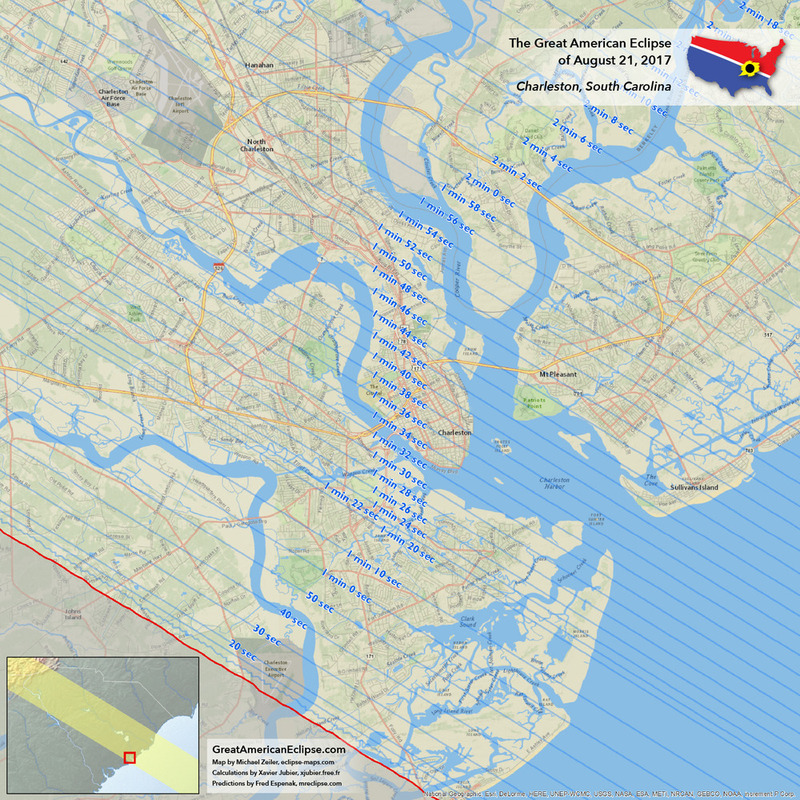 After traversing the United States from Oregon in just 94 minutes, the Great American Eclipse of 2017 leaves the United States at South Carolina. 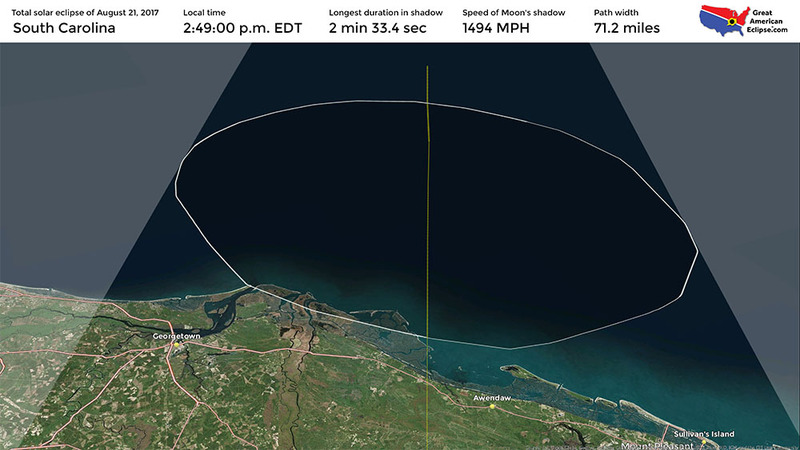 After leaving the eastern coast, the Moon's shadow passes over most of the Atlantic before ending at sunset near Africa. But no other land mass, island or continent, is again touched by totality. 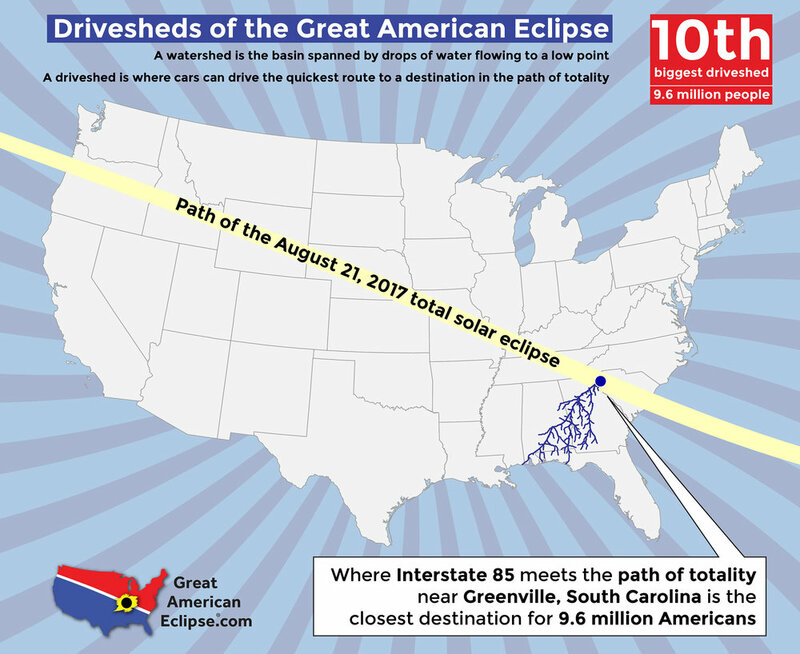 The path of the total solar eclipse lies exclusively within the United States. According to eclipse meteorologist Jay Anderson on his website eclipsophile.com, the odds of clear skies in South Carolina are fair. 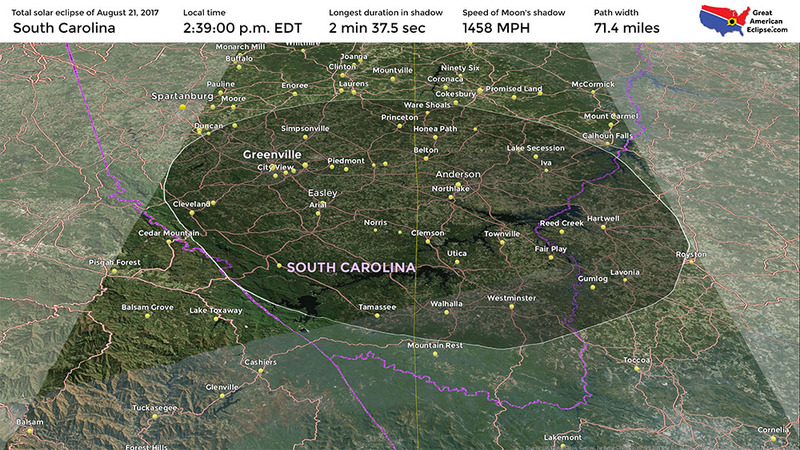 If you want to see totality in South Carolina, be prepared to quickly relocate based on cloud conditions. If the weather forecast the day before is not favorable, strongly consider driving to an adjacent state within the path with a better forecast. A pro-active eclipse chaser can increase her odds of success by studying the short-term weather forecast before eclipse day and being prepared to relocate if necessary. That being said, it is very possible that you can successfully see totality in South Carolina. 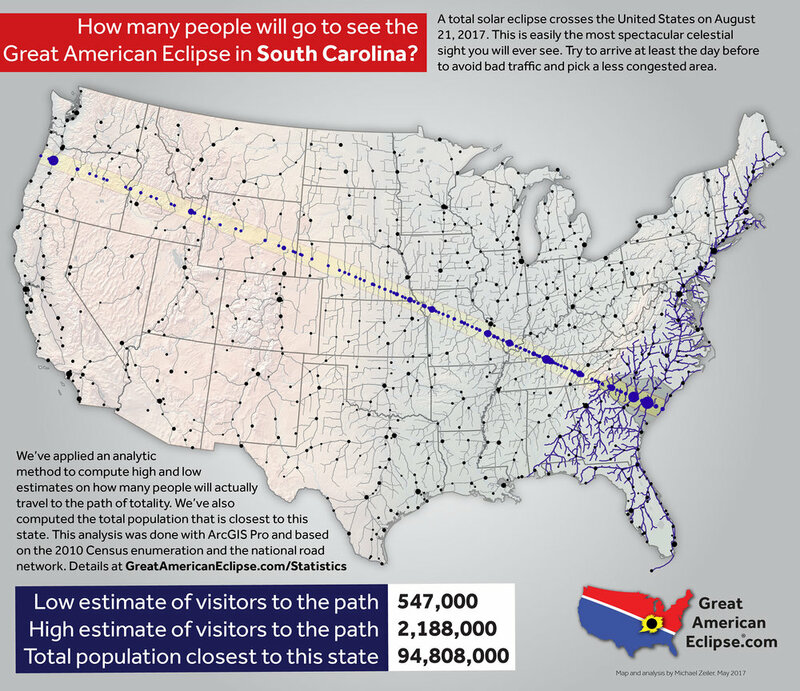 South Carolina will be a significant destination for the eclipse because it will be the nearest spot within the path of totality for at least 100 million Americans in the Atlantic Seaboard and Florida. 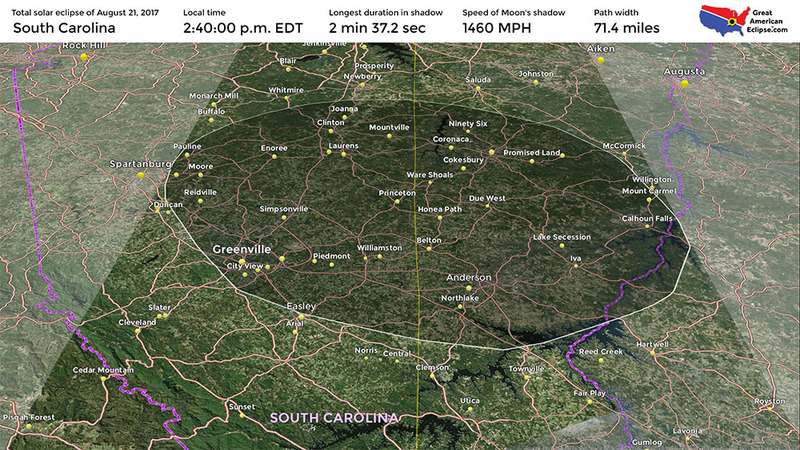 Eclipse duration near the center of the path is quite good in South Carolina, as much as 2 minutes and 38 seconds which compares very favorably with the maximum eclipse duration of 2 minutes and 41 seconds. 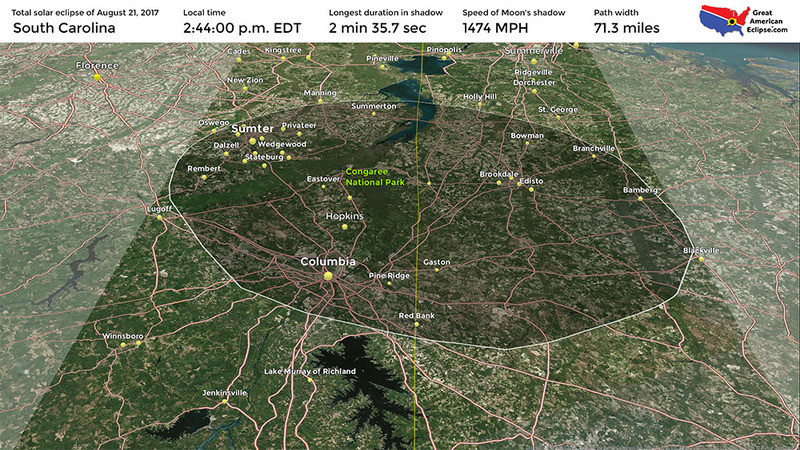 Greenville experiences 2 minutes, 8 seconds of totality. Spartanburg is just outside the path of totality. 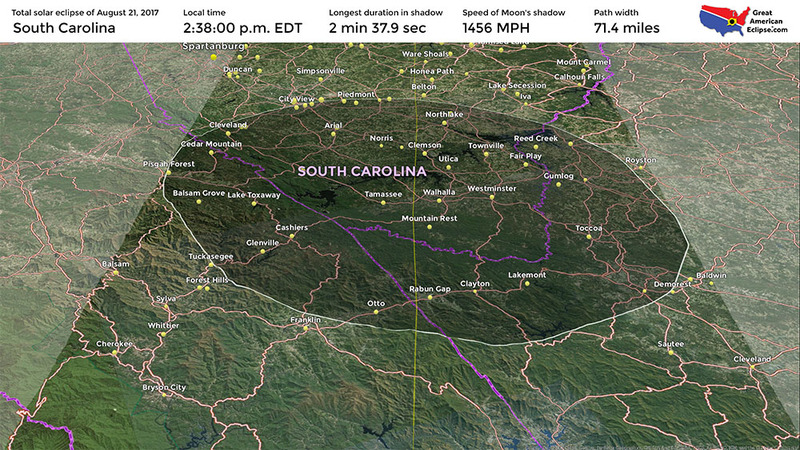 Columbia will enjoy 2 minutes and 30 seconds of totality. 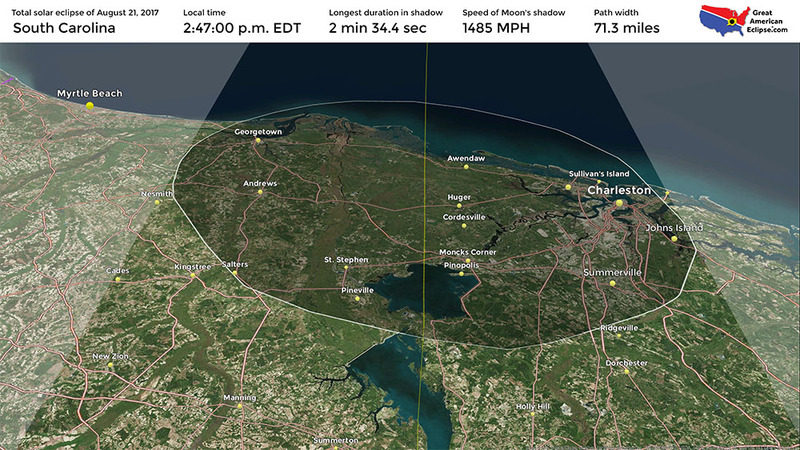 Charleston will see 1 minute 40 seconds of darkness. 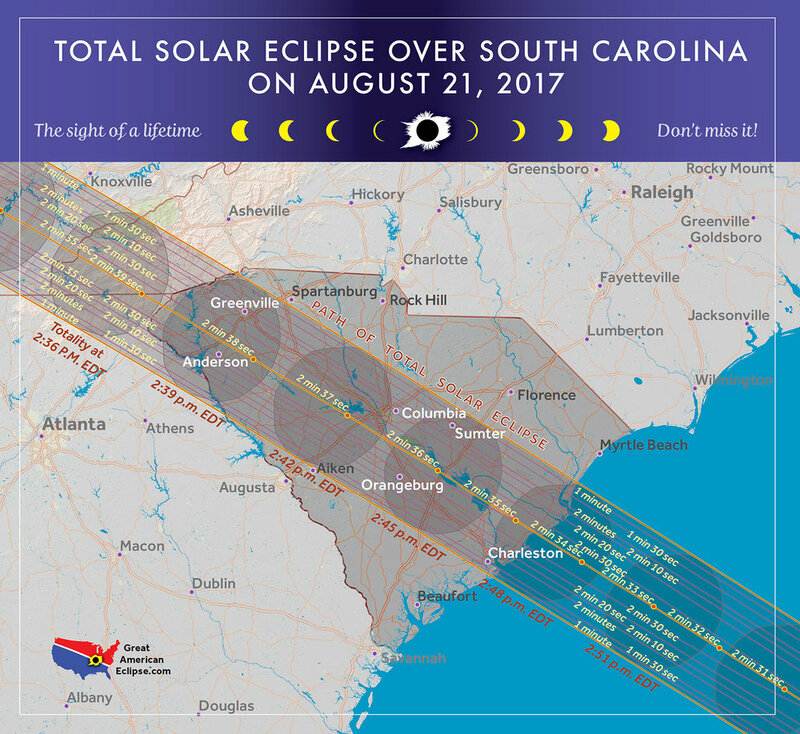 CLICK FOR THE South Carolina STATE PAGE ON ECLIPSEWISE.COM. THE SITE PROVIDES THE MOST COMPREHENSIVE AND AUTHORITATIVE STATE PAGES FOR THE 2017 ECLIPSE. ECLIPSEWISE.COM IS BUILT BY FRED ESPENAK, RETIRED NASA ASTROPHYSICIST AND THE LEADING EXPERT ON ECLIPSE PREDICTIONS. The total solar eclipse first enters the state at 2:36 p.m. EDT and leaves the Atlantic coast at 2:49 p.m. EDT. Although it has been a hiatus of 38 years since the last total solar eclipse within the United States, it will be a relatively short 7 years until the total solar eclipse of April 8, 2024 revisits North America.